The journey of a fine cut gem stone from its origin rock to its destination the beautiful neck, arm, and ears is a rigorous and interesting path. It starts it journey from rocks where it has only name, to the factories where it gets its shape and size and the fire. It is simply the best example of the craftsmanship and imagination of mankind, which has created ample of beautiful artifacts excavated from the earth. 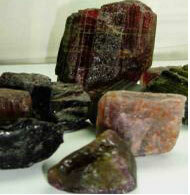 Please tour my factory and see how a dead stone transforms in to a lively cut gemstones. are sorted out and are graded according to there properties. Marked rough get chipped down on the basis of marking and the color gradation. 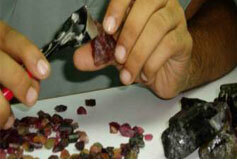 This is most important, decisive and crucial part of the gem stones making. 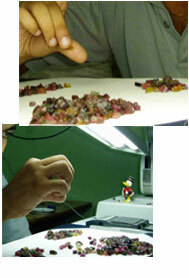 Here the sorter sorts the stones, for its shape i.e. round, oval, drops, bell, etc and size i.e. 3mm, 4mm, 5mm, etc. Colors i.e. light, medium, dark. After sorting the chipped stone, now comes the turn to give them desired shape n size. 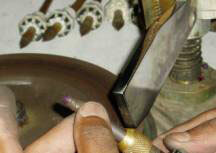 Here highly skilled artisans facets, carves, and polishes on the running wheel. Now it is the turn of final sorter to sort out and make grades of these faceted stones on the basis of its facets, transparency, opaqueness, translucency, color density, chipping, and cracks.